Sometimes, when the way ahead is a little murky, choosing to just begin and try things out is the best way to approach the challenge, task, or issue at hand. 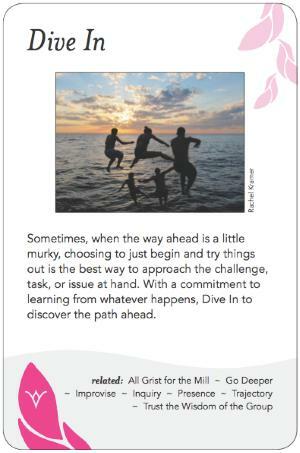 With a commitment to learning from whatever happens, Dive In to discover the path ahead. There are situations in which, because of the complexity of an issue, lack of knowledge among participants, or disagreement about what approach to take, the facilitator may choose to encourage the group to just begin, to follow their instincts or areas of passion and probe, learn and try things out, and see what happens, and then collectively assess "what it (the things they've learned and tried) all means", and how to proceed next to address the issue. In these situations, it's important that the facilitator not front load, not reassure or steer, and not emphasize the cognitive or intellectual preparation for doing something, but instead get into the embodiment of it. There is therefore not too much description of what is about to happen, but rather a call to be action oriented, and to probe and explore the issue with an open mind. The group is encouraged to trust the process, to appreciate that, as they say in Open Space, "whatever happens is the only thing that could have happened"
This approach is especially good for work in the affective domain, where the group is looking for a shift in values or attitudes - where you want to get out of the head, don't want to reinforce old pattern that you're trying to change, by describing it or delving into it in too much detail. Following Kolb's learning cycle, this gives you concrete learning on which you can reflect, trusting the group's collective instincts, innate abilities to learn and solve problems, and honouring what the group already knows. This approach also de-emphasizes the power differential between the facilitator and group... they are figuring solutions out by discovery learning, rather than being told by the "sage on the stage". This power can facilitate someone overcoming their fears or resistance - and can build strength, self-awareness, and self-confidence in the group. It can also be a more effective way of learning about and finding practical approaches to issues that are inherently complex, where the number of variables and their cause/effect relationships are vast or unknowable, and where traditional analytical problem-solving methods are unproductive or even futile. Trust is HUGELY important in this approach...that the facilitator knows the group's norms, levels of capability, and emotional health sufficiently to know that throwing them in the pool is actually in the best service of their learning. The group then builds muscle memory and will be more willing to leap the next time. The risk of failure is considerable and should be recognized and spelled out to the group at the outset. The traditional Adult Learning Journey is that we want to go straight from unconscious incompetence to unconscious competence....we resist having to sweat through the intervening conscious steps in the learning process. Adults need both to be challenged out of their comfort zone to learn, AND at the same time not be embarrassed...there's a tricky dance here...no shaming, but challenging, encouraging, inviting. Different learning styles require different approaches... action before reflection works really well for some people, but not others. There's also the interplay of unstructured group activity: the risk of groupthink and the tyranny of the group (mob) but also the extraordinary outcomes that unrestrained creativity and collaboration can surface. Not generally appropriate in simple-to-moderately-complicated situations where a more structured, disciplined approach would be more efficient and effective. Can be threatening to participants wanting lots of structure and direction.Can actually destroy trust, if power is exerted inappropriately by some participants, or is coercive.People can feel "outed", violated, embarrassed if the challenge crosses a personal boundary. "Who would like to stand up and do a demonstration about this (whatever) so that we can give you feedback and draw out the learnings?" ...by the time five people have done that, the participants have learned a tremendous amount and you can summarize or invite reflection to find the richest learnings. "Let's make this decision and see if we can make it work...we'll figure out the policies later"